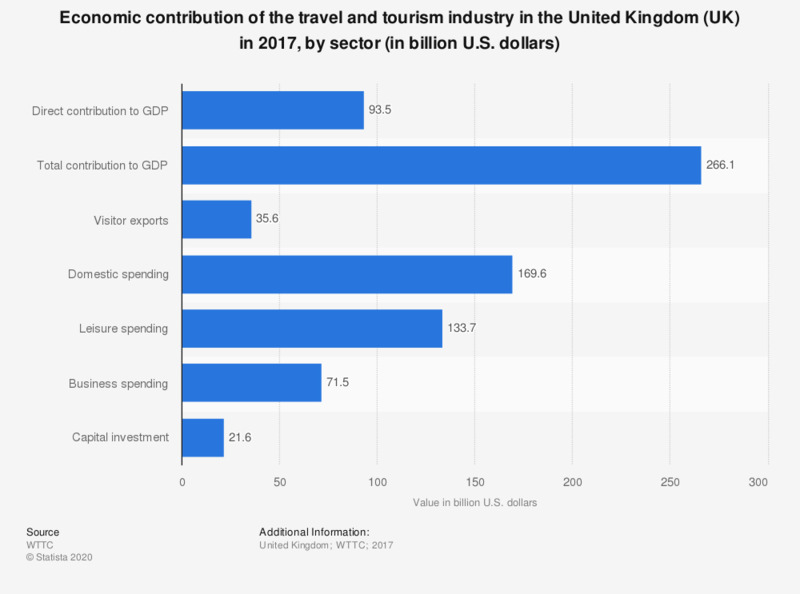 This statistic shows the economic contribution of the travel and tourism industry in the United Kingdom (UK) across various areas in 2017. Direct contribution to GDP amounted to 93.5 billion U.S. dollars. Figures are based on constant prices and exchange rates. Total contribution to GDP: GDP generated directly by the Travel & Tourism industry plus its indirect and induced impacts (see below). Visitor exports: spending within the country by international tourists for both business and leisure trips, including spending on transport, but excluding international spending on education. Business Travel & Tourism spending: spending on business travel within a country by residents and international visitors. Leisure Travel & Tourism spending: spending on leisure travel within a country by residents and international visitors. Capital investment: includes capital investment spending by all sectors directly involved in the Travel & Tourism industry.